Other Modern: Chasuble #2715, Fraefel & Co.
"We are the College of St. Mary Magdalen"
Sursum Corda: calling all Young Adults! 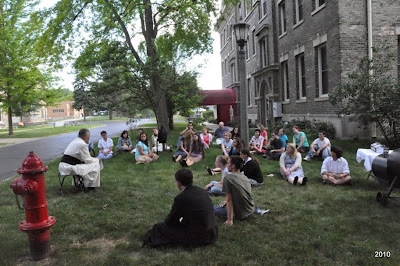 Many people have asked the Canons of the Institute when they would be offering a program of solid spiritual, doctrinal and moral formation geared specifically to young adults. When young people leave home for the first time and begin to study or work with those who do not know Christ, their faith is quickly put to the test. To them especially apply the words of Scripture: Always be prepared to make a defense to anyone who calls you to account for the hope that is in you (1 Pt 3:15). The day has arrived! The Institute of Christ the King now presents Sursum Corda, a nationwide initiative to foster the spiritual lives of the young adults in our apostolates. For the second year in a row, Sursum Corda is offering a social and spiritual weekend for young people ages 18 and up, August 10 through 13, 2012. The event will be held in Milwaukee, Wisconsin at the Retreat Center located on the grounds of St. Francis de Sales Seminary (3257 South Lake Drive, St. Francis, WI 53235). 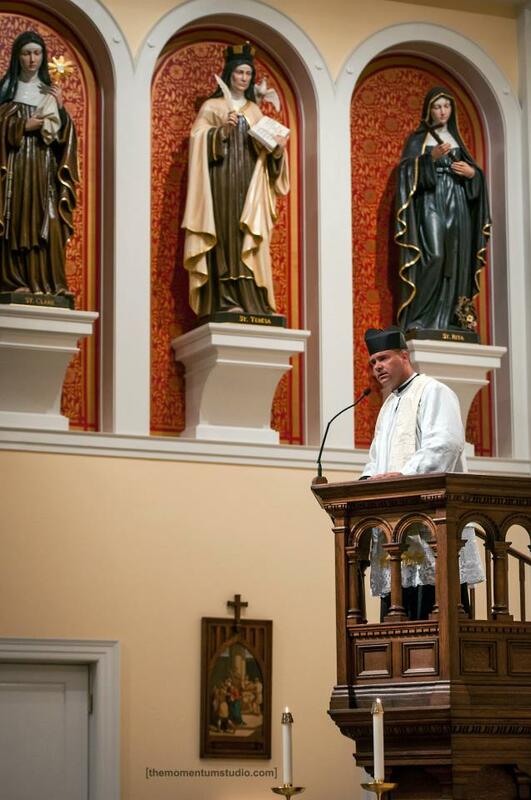 Canon Aaron Huberfeld, Rector of St. Mary’s Oratory in Wausau, will be the chaplain for the camp, and several other canons are sure to be there as well. The program includes daily Mass, prayer in common and opportunity for confession, faith formation classes and discussions, and other social activities for the young men and women. The weekend begins with check-in at 3:00 PM on Friday, August 10 at the Retreat Center and will end on Monday, August 13 at 12:00 PM. Please register online at www.institute-christ-king.org. The cost is $235 per person with a $100 deposit required at registration. The number of participants is limited to 35, so register today! 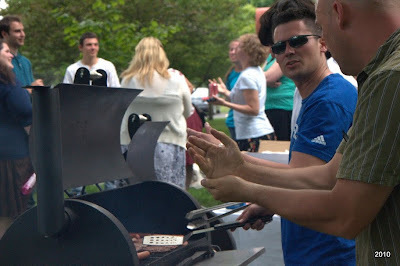 Please also visit the website to see pictures from last year’s Sursum Corda weekend, which was a tremendous success. NOTE: Due to limited finances, many young people are not able to register for this event. If you would like to help defray the cost of the camp for a young person in need, please send your donations to St. Stanislaus Oratory, 524 W. Historic Mitchell Street, Milwaukee, Wisconsin 53204. Please make checks out to Institute of Christ the King. Thank you for your generosity. Here is a report from the previous Sursum Corda retreat, along with a few photos. 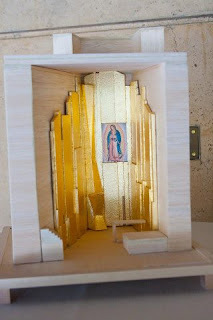 I was once asked some years ago, by a client, to do a capriccio, or architectural fantasy, which showed what I might do with the interior of Los Angeles Cathedral if given the chance. 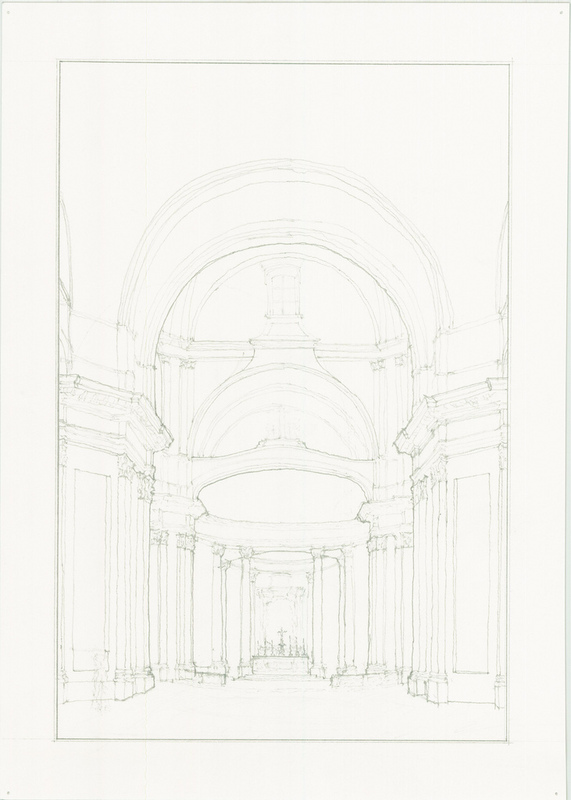 The client began with the suggestion I adapt and incorporate the historic Baroque reredos currently sitting somewhat absentmindedly at the back of the cathedral into a new focus for the sanctuary. The result was quite striking; one of these days I may share it with the readership. 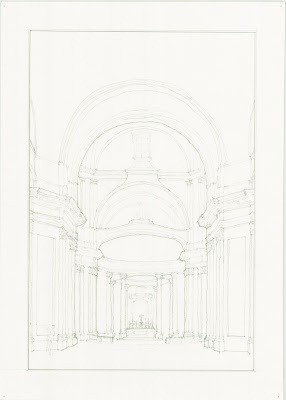 The cathedral is planning some further embellishments, though of a less felicitous nature. The cathedral Facebook page recently featured a maquette for a new shrine to Our Lady of Guadalupe to be installed in one of the church's currently empty side-chapels. I have not been able to track down any other information about it, even the designer. Models are not always useful, and I presume there will be a bit more to the design than currently shown. It would appear that what I thought at first was an altar engaged by its south side to the wall is in fact a prie-dieu. 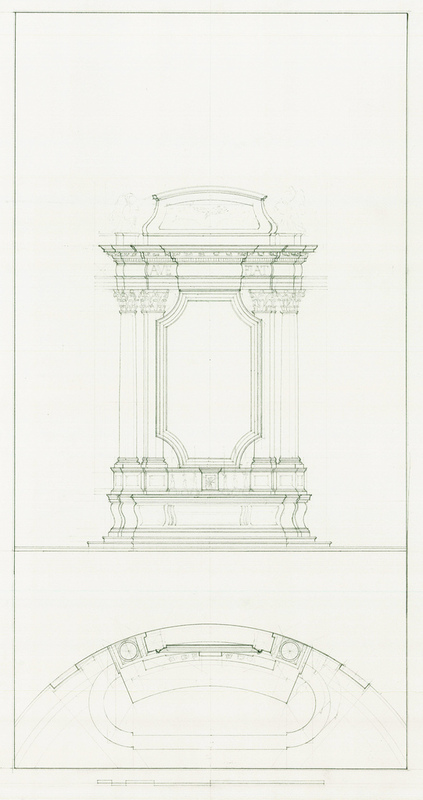 I have to admit that while I'm troubled by the design, it is not without interesting aspects; one could easily see it being turned, with a bit more symmetry and a hint more detail, into something with an almost Art Deco feel. However, as it stands, it is currently an assemblage of jagged, unsettling shapes framing a de-contextualized image of the tilma. It may be well-designed by contemporary artistic standards, but I'm not sure I could pray there. It is mute. There is none of the richness of Mexican Catholicism; the only thing Baroque about it is its gilding. And it is a pity, for, as a friend of mine pointed out, this would be an ideal location, being rather self-enclosed, for a small-scale Baroque reredos bursting with rich symbolism that would pay homage to the Empress of the Americas--a manifestation of a venerable Catholic culture that was already nearly a century old when the Pilgrims landed at Plymouth. The exquisite Lundberry cope was executed and superbly embroidered by Dominican Sisters at St Dominic’s Priory in North Adelaide, South Australia, in 1906. The priory was founded from the Stone convent in 1883. The cope was designed by one of the founding community, Mother Francis Philomena Ullathorne OP, niece of William Bernard Ullathorne OSB, Archbishop Birmingham, England, and reveals her considerable artistic talents. The series of eight embroidered rectangular compartments on the orphreys contain within trefoiled arches Saints Antoninus, Raymond, Augustine, Rose of Lima, Catherine of Siena, Thomas Aquinas, Francis and Vincent. 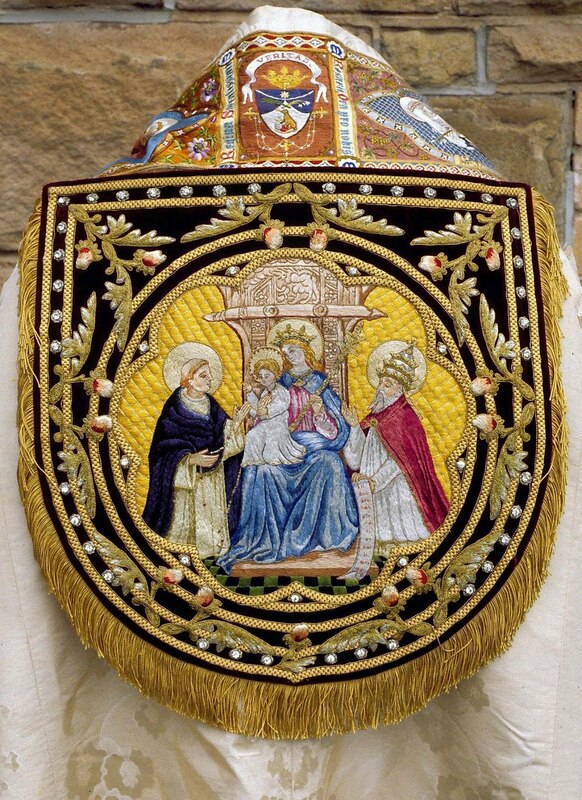 On the hood is a representation of St Dominic, attended by Pope Honorius III, receiving the rosary from the Blessed Virgin, enthroned and with the Christ Child on her knee. The excellence of the skills involved is revealed in the extraordinary amount of minute multi-coloured detail on the orphreys. Very recently there has been some debate and controversy around some positions attributed to the Ordinary of the American Ordinariate, Msgr. Jeffrey Steenson. Particularly, the question circulates around his positions concerning the usus antiquior and those attached to it. 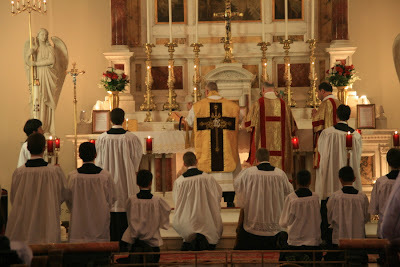 "We have therefore asked that the congregations of the Ordinariate follow this direction. Some of our clergy want to learn also how to celebrate according to the Extraordinary Form of the Roman Rite. 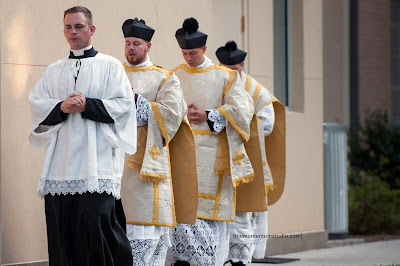 They are certainly encouraged to do so, under the provisions of Summorum Pontificum and under the supervision of the local bishop, to assist in those stable communities that use the Extraordinary Form. 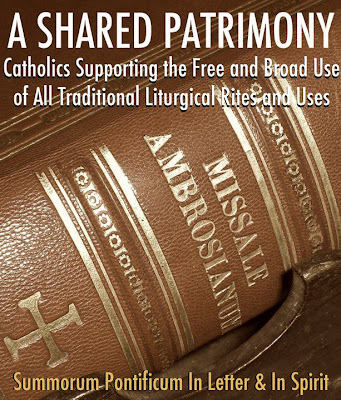 But as the Extrordinary Form is not integral to the Anglican patrimony, it is not properly used in our communities. The Ordinariate will remain focused on bringing Christians in the Anglican tradition into full communion with the Catholic Church. We also are pleased that the Church has provided for the continuing use of the Extraordinary Form, particularly as a pastoral response to traditional Catholics, and regard all of this as a well-ordered symphony of praise to the Blessed Trinity." Here are two recently completed works of my own. The first is my own version of a Western iconography. It is Christ in Majesty and will go into the chapel at Thomas More College in Merrimack. I have created the basic design on a Romanesque illuminated manuscript. 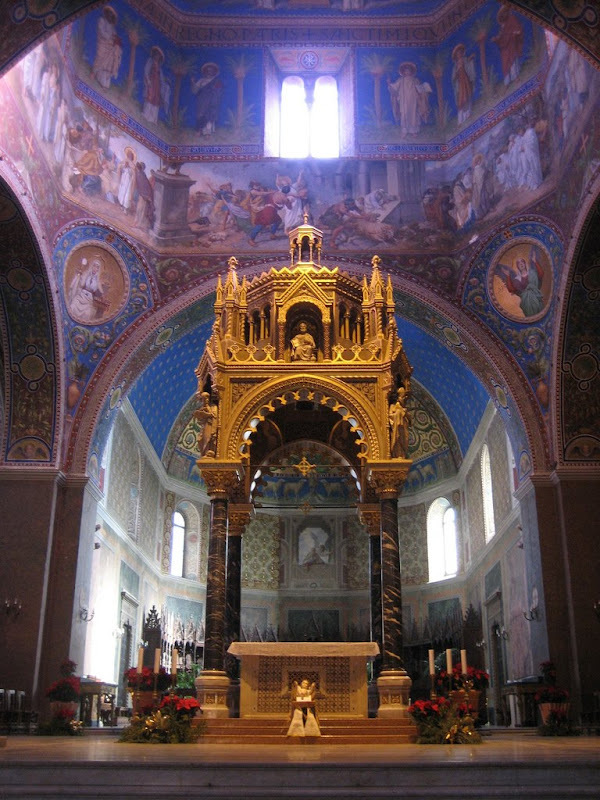 Christ is enthroned in heaven in glory, surrounded by the six winged seraphim and the four angels representing the four evangelists take the Word to the four corners of the world. In considering how to do this, I felt that in this the figure's sitting pose in the original is too unnatural and primitive for the modern eye. 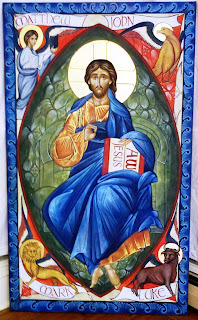 So I looked to the 20th century Russian iconographer, Gregory Kroug for the basis of the central figure. Kroug is interesting to study. 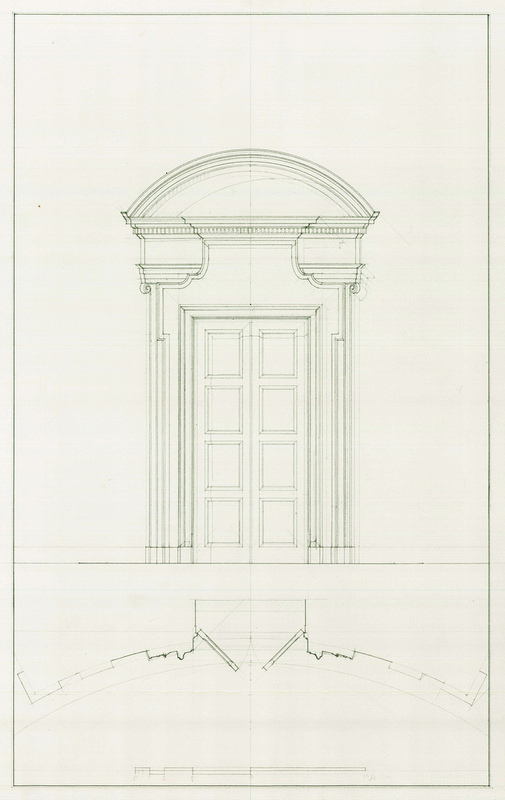 Although the form is highly stylised, he was a very skilled draughtsman who placed the relative positions of limbs and torso accurately to reflect the gesture he wanted to show. The third inspiration for me is a 16th century Christ in Majesty that I saw at the Museum of Russian Icons in Clinton, Massachusetts in which the six winged seraphim who surround the throne are portrayed in monochrome in a deep green background. And finally, the face is my own style, but heavily influenced by my teacher, Aidan Hart, the British iconographer. I started this painting over the Christmas break and finished it in early May. 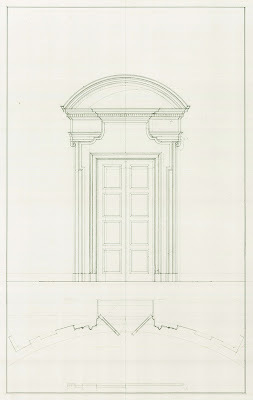 The panel upon which it is painted is about six feet long. The second is an icon of St Victoria. I chose this subject because I painted it to give to a friend for the baptism of her baby daughter, Victoria. It is much smaller, about 10 inches long and painted on good quality watercolour paper. This took me about eight hours to paint. St Victoria according to the source I read, died in 304 and lived in Italy. When she refused marriage and to sacrifice to pagan gods because of her faith, she was martyred (that is why she is holding a cross in the icon). The guard converted because of her witness to the faith and was himself martyred. Fr. 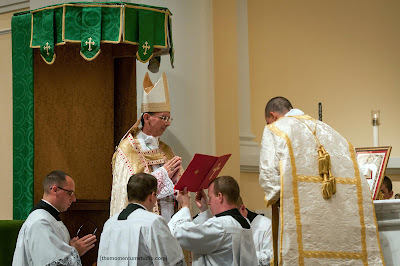 William V. Blazek, S.J., newly ordained for the Jesuit Chicago-Detroit province, celebrated his first Solemn High Mass (Extraordinary Form) on June 24 (Nativity of St. John the Baptist) at Mary Immaculate of Lourdes in Newton, MA. Serving as deacon was Fr. Charles J. Higgins of the Archdiocese of Boston and pastor of Mary Immaculate of Lourdes. Serving as sub-deacon was Fr. John Rizzo, FSSP, visiting from his assignment in Australia. 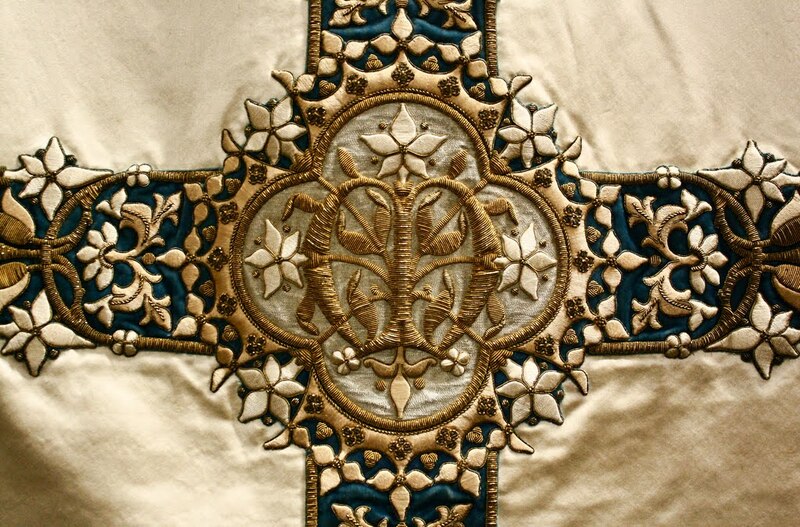 Detail from an 19th-century chasuble made by the Dominican sisters at Stone, Staffordshire. Photo by Fr. 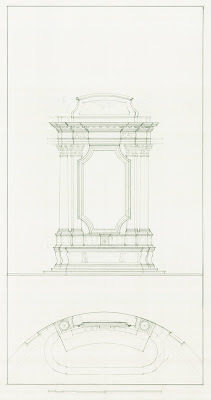 Lawrence Lew, OP. I am receiving wonderful reports from the annual meeting of the National Association of Pastoral Musicians. There is more talk of chant, more emphasis on Mass propers, a greater degree of willingness to rethink prevailing practices. Books published by the Church Music Association of America are being discussed and debated, and there is growing talk of what it means to draw the ordinary form experience closer to the extraordinary form. This event comes in the wake of the CMAA's own annual colloquium, which was an amazing success in every way. Somehow it seems that something gigantic and momentous is taken place in the world of Catholic music. After so many years, when enthusiasts, scholars, and dedicated musicians have worked to push the rock uphill, against all odds, there’s a new momentum out there, much to everyone’s surprise and relief. The rock is now rolling downhill. It is an energy that is broad, diffuse, and unquestionably authentic. The sacred music movement is set to define the future of Catholic music. It probably doesn’t seem that way in your parish, not yet. But the times are changing. The ground has shifted. Scholas are starting everywhere today, parish by parish. They are using music that is both free online and sold in beautiful editions. These editions are most published just in the last two or three years. They are mostly published by institutions that have virtually no funding at all, and have either few employees or none. But the power of the idea (sing the liturgy) and the beauty of the liturgical song they embody is making converts by the day. The Sacred Music Colloquium was held in Salt Lake City, where you will find the Cathedral of the Madeleine, which, to everyone’s shock, turns out to be the home to the best Catholic choir in America. Salt Lake City is probably the last place you would expect to find such a thing but such is the way the reform is turning out: there are delightful surprises around every corner. When the conference director (Arlene Oost-Zinner) of the Church Music Association of America suggested shifting the annual event from the East Coast to the West, one could detect some degree of skepticism. Nothing like this had ever been tried before. It was a highly risky step for an organizing that is always one small step away from bankruptcy. But look what happened: the conference filled up to capacity (270) weeks ahead and we ended up having to turn people away. And this was certainly the happiest group of campers I’ve ever seen at the Colloquium. They came from all regions. All ages were represented. There was a nice balance of new singers and professional musicians. They practically floated through the week. The faculty was varied and massive, as never before. More priests were in attendance than ever. 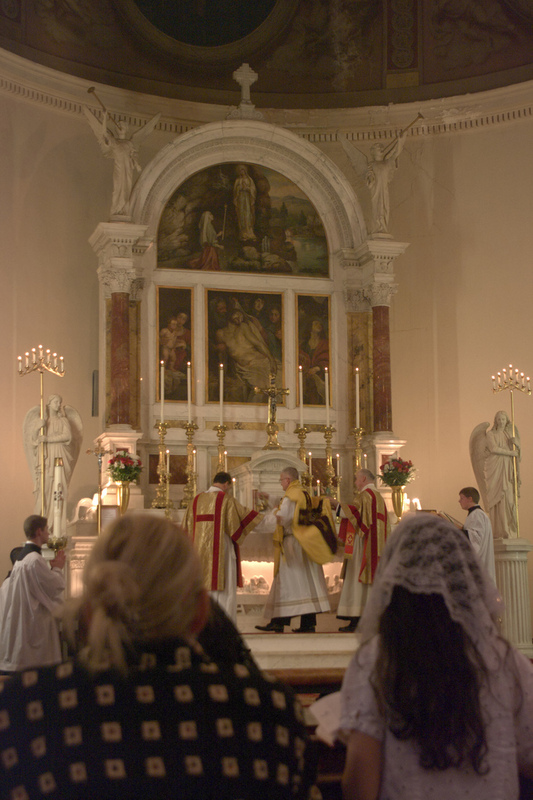 The liturgical program was more spectacular than ever. And the breakouts were amazing. We had sessions on English chant, hymnody, sight singing, vocal production, organ repertoire, chant typesetting, parish administration, and so much more. People left each session with high praise for the teacher and the learning environment. Also, the book that we brought all sold, with an English psalm book (again by Oost-Zinner) and a book for chant for kids (Words with Wings) topping the bestseller charts. Also, of course, all the official music books of the Roman Rite sold well. We tried a new method for dividing up the chant choirs. We used to do beginning, intermediate, and advanced, but this approach didn’t quite achieve the goal. This year we had two beginning classes, two refresher classes, and two performance scholas that prepared nearly all the music for Mass. In addition, we had two master classes that delved very deeply into the scholarship of the oldest manuscripts, all in an effort to bring more sophistication to chant performance. I gave a four-part lecture series on the history of sacred music in the United States, based on all my reading and research over the years. I set out to debunk two main myths that are in the air: 1) that all our problems began after the close of Vatican II, and 2) all the problems we face are due to liberal hippies who hate the classics. Once dispensing with those two ideas, we can begin to confront the complex realities of how we ended up in the awful state that we’ve seen for decades, and then, as a result, see that there is a way out of the mess. The pathway forward is not as foggy as it once was. We finally have liturgical books that we can sing from, primarily the third edition of the Roman Missal, plus books of chanted propers that have recently become available. We are finally seeing hymnals come to print that are actually related to the liturgy itself and not just providing pop music that is external to the rite. Each year the number of people who are interested in making a change grows, and they are learning from other people who have traveled the same path. In my sessions and many others, there was frank talk about the difficulties of making the transition at the parish level. There are few singers. There is no money. Pastors are afraid of change. Every change inspires some level of resistance from a small pocket of people. We spoke about all of these problems, and offers solutions from our own experiences. Also, this kind of exchange and learning continues daily at the musicasacra.com forums, where members offer each other helpful advise and guidance. There are too many people who were involved in making this event a great success to name them all. But certainly the Cathedral staff and Gregory Glenn deserve high mention here. What they have done in this city is just spectacular, and they supported the Colloquium in every way. There is a movie soon to come out about their efforts. It’s called “The Choir.” We saw an early screening of it. It was so excellent that it will surely inspired the creation of other choir schools around the country. I should also mention the contribution of Msgr. Andrew Wadsworth, who has provided so much guidance, the brilliant leadership of William Mahrt, and the inspiration provided by Fr. Guy Nicholls of the Birmingham Oratory. Again, it’s dangerous to name names because so many people were involved, not the least of whom were the many attendees who scrimped and saved to raise the money to attend. So here we have it, a movement with energy, enthusiasm, deep knowledge, true love for the beautiful, and all rooted in a genuine desire to do what the Church intends. There is just nothing else like it out there. This is truly the future, and that future could arrive much sooner than you think. From Friday July 6th to Sunday July 8th, the Australian Catholic Students Association (ACSA), held its annual conference in the City of Melbourne, Australia. The Conference was held at Queens College, a residential college of the University of Melbourne. The conference was entitled Defending Human Dignity and Fr Aidan Nichols OP was the invited international speaker. 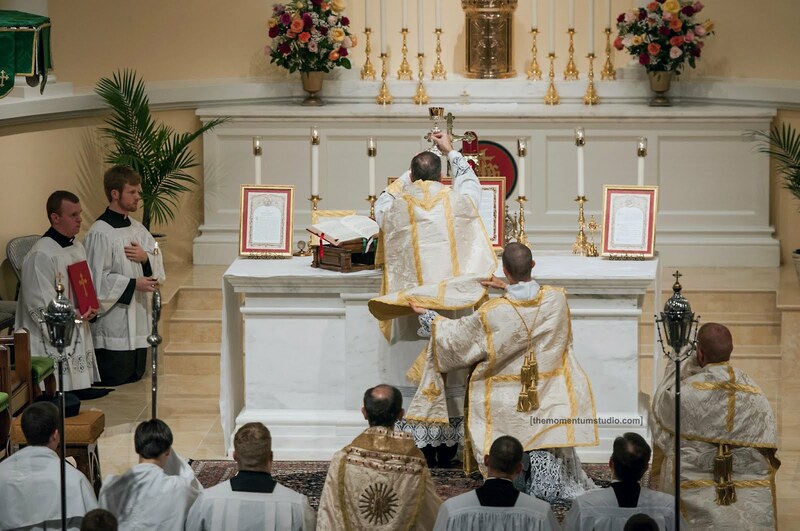 The liturgical life of the conference consisted of three celebrations of Holy Mass, three celebrations of the Divine Office and an all-night vigil of adoration. The Opening Mass was a Votive Mass of the Holy Spirit, Missa Cantata, celebrated by Fr Glen Tattersall, chaplain of the Catholic Community of Bl. John Henry Newman and diocesan priest of Archdiocese of Melbourne. 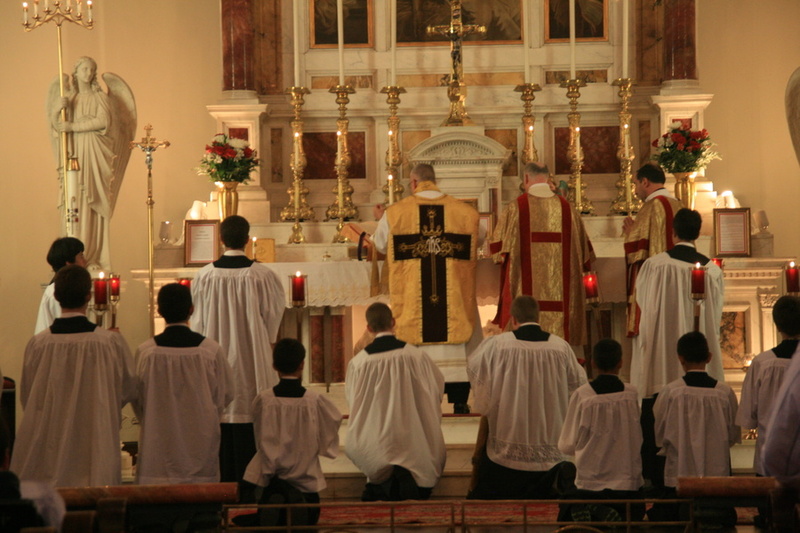 The Mass was celebrated at Queens College Chapel. The day was closed by a solemn period of adoration, benediction and then Compline, after which the Sacrament was left exposed for all-night adoration. Saturday began with Lauds celebrated in Queens College chapel. 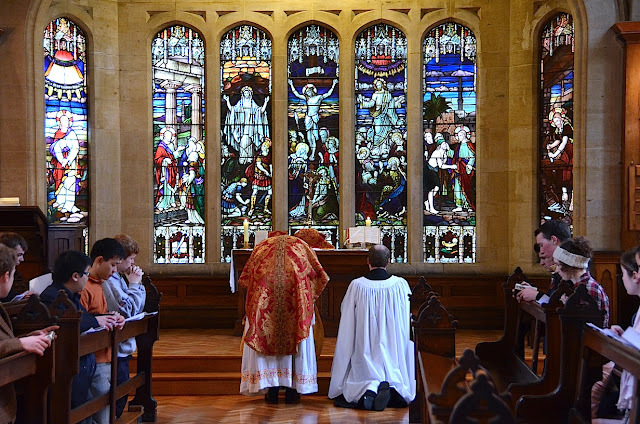 The Mass of the day was celebrated in the ordinary form by Fr Aidan Nichols OP at Newman College Chapel, likewise another Melbourne University College. It was a votive Mass of Our Lady Seat of Wisdom, the Patroness of ACSA. The Mass was celebrated solemnly with all the propers chanted by the Schola of Corpus Christi Seminary, of the Archdiocese of Melbourne and most of the Mass was chanted by the respective ministers. 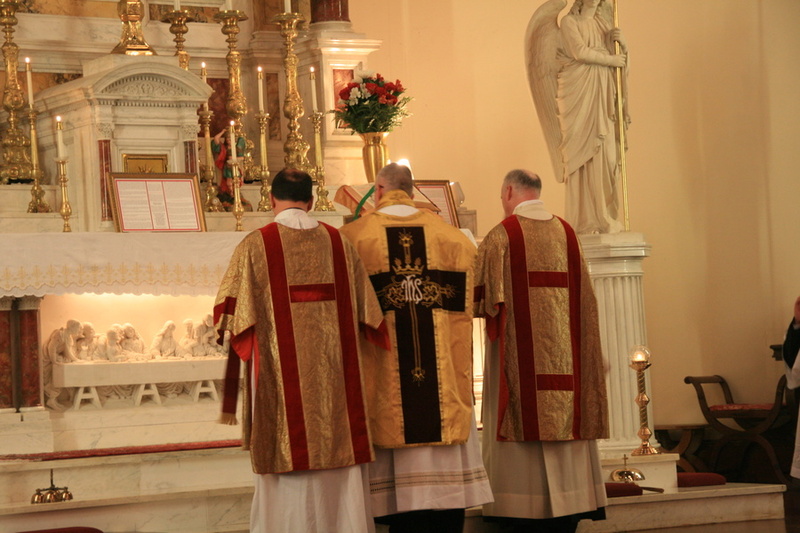 Ad orientem was the chosen position of the Mass. 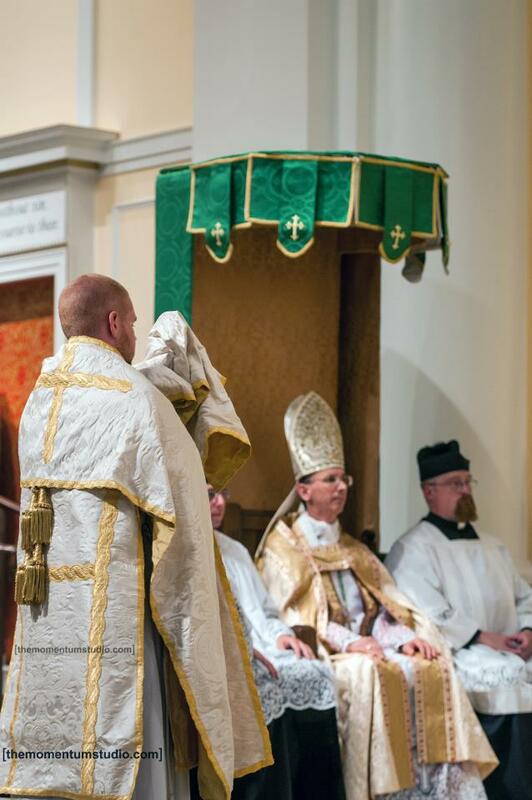 Fr Simon Ckuj, a priest of the Ukrainian Eparch of Australia preached and acted as the principle concelebrant along with Fr Gregory Jordan SJ, ACSA’s national Chaplain. Sunday also began with a celebration of Lauds in Queens College chapel. 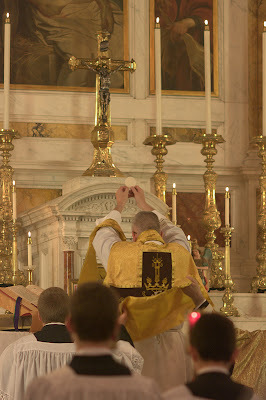 The closing Mass of the conference was celebrated in the ordinary form, by Fr Gregory Jordan SJ, at Sacred Heart Church, Carlton, which is attached to Corpus Christi Seminary. This Mass was celebrated Versus Populum, The propers of the Sunday were chanted and the schola was conducted by Mr. Richard Lyons, who earlier that morning was elected with an overwhelming number of votes as the new President of ACSA. 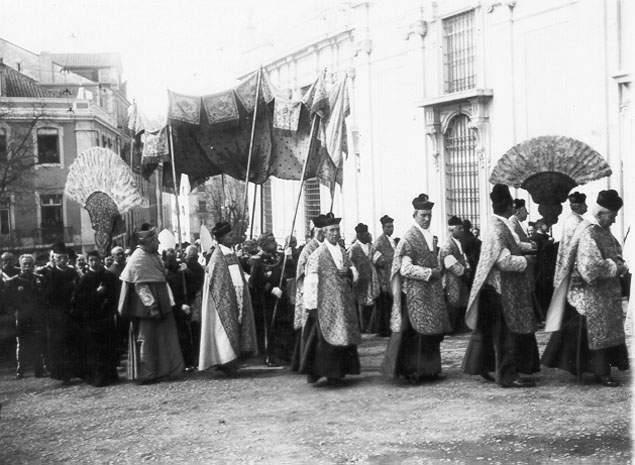 I know that many of our readers are interested in older historical photographs and video of the sacred liturgy. 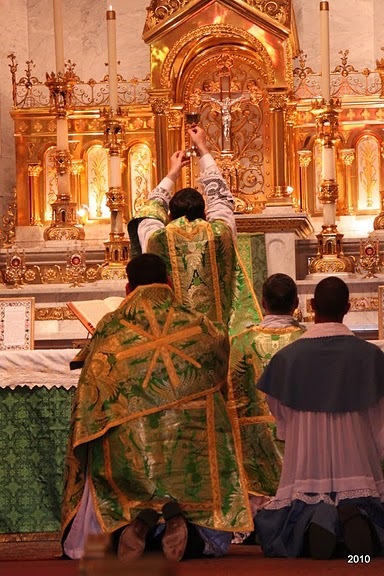 Over the years we have presented a number of such things, including some rather rare glimpses of some of the other Western liturgical uses. 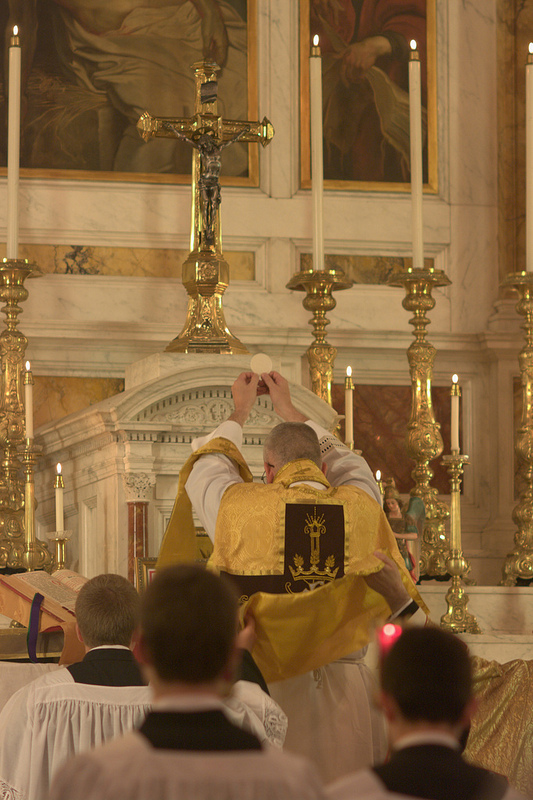 We have shown images and video from the Pontifical Lyonese liturgy, the Carthusian liturgy, we have shown rare views of the Solemn Papal Mass, video of the Carmelite liturgy so on and so forth. 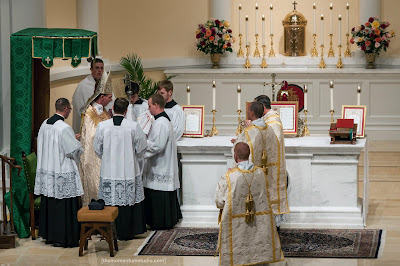 However, one thing we have never yet shown -- indeed, I have never once run across such a thing -- are historical images or video of the pre-conciliar Mozarabic liturgy -- which would evidently be very rare given the rarity of that form of the liturgy itself. So then, a challenge to our readers, particularly those of our readers who may be in the area of Toledo, can you come up with such? One of our readers, George Logusch, a graduate student from the University of Notre Dame School of Architecture, sent in some watercolours and drawings of a project he worked on under Thomas Gordon Smith in the spring of this year, which is a "proposed refounding of an existing Benedictine Monastery located in Morristown, NJ." There are many liturgical treasures still to be found around the world, but few would be as impressive as the treasure trove of liturgical vestments dating back centuries, which are to be found in the museum belonging to the Clonfert Diocese in Loughrea County Galway, on the West Coast of Ireland. 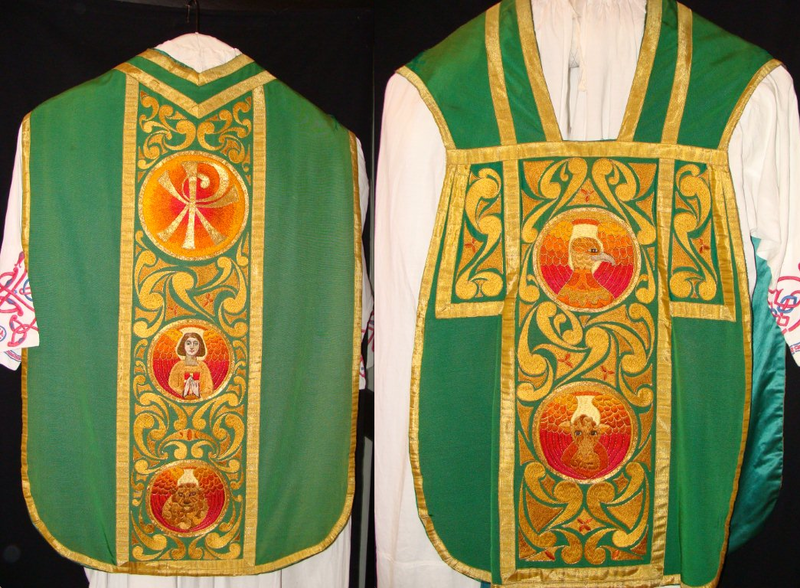 Among the many vestments one stands out for both its liturgical use and historical significance. 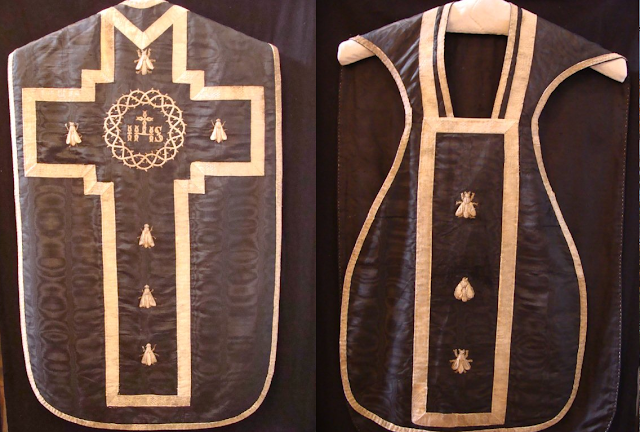 Known as the Napoleon III ‘Requiem Mass set’ these vestments are made of water silk and consists of a cope, chasuble, dalmatic, tunic, stoles, and maniples. The set is decorated with silver purling braid, and display the Napoleonic ‘bee’ motif. 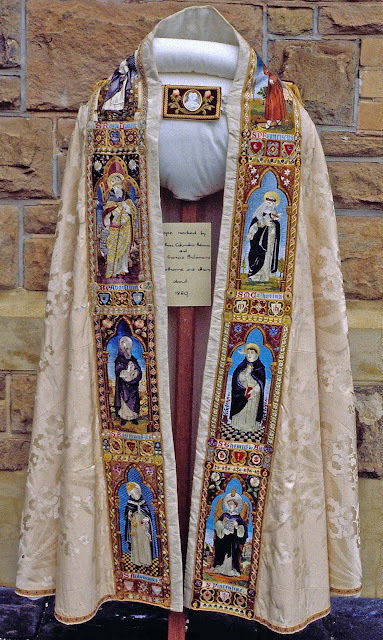 This set was presented to Father William Manning PP of the Aughrim County Galway parish, in 1858, on behalf of the Emperor Louis Napoleon Bonaparte, so that a solemn requiem High Mass might be said for the happy repose of the souls of the French soldiers who died there at the “Battle of Aughrim” on the Sunday the 12th of July 1691. Some 7,000 men died on that day, with French fighting French, while an array of others from England, Denmark, Dutch and Scottish troops made up two armies, one called the Jacobites while the others were known as the Williamite forces. One of the personal chaplains of the Emperor, M. L’Abbe Cruise of Paris was present in 1858 for the presentation, as he had some family connections in Ballinasloe. Some of the chasubles here go back as far as the late 15th century; with some coming from England while others are French, Spanish, Italian, and Irish. Some of the most remarkable exhibits of the collection are the altar missals. These are very rare books and include the Incunabulum Missal of 1470, the Folio Missal in white sheep-skin binding, of Paris 1652, the large Quarto Missal of Lyons, 1721 and the Octavo Missal of 1840. There are also a large collection of chalices, some gold, and others silver. The ‘Matheus Macraith’ chalice is solid gold and dates back to 1500, while the others come from that time onward to the present time. 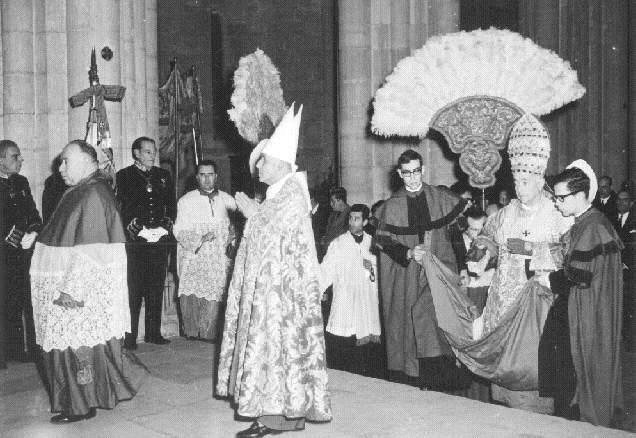 It has been a little while since we have shown our readers any archival photographs of liturgical ceremonial, and so I thought I would share these showing the Patriarch of Lisbon. Amongst the items of interest here are the use of the flabella (which many will recognize from papal ceremonial of old, as well as the Dominican rite -- to namely only two such instances), and some of you may notice the rather "tiara" or "triregnum" like look given to the mitre worn by the patriarch. For a bit more on some of what surrounds this, interested readers may like to travel all the way back to a post published on here in 2006 by Matt Alderman, Curiosities of the Tiara. 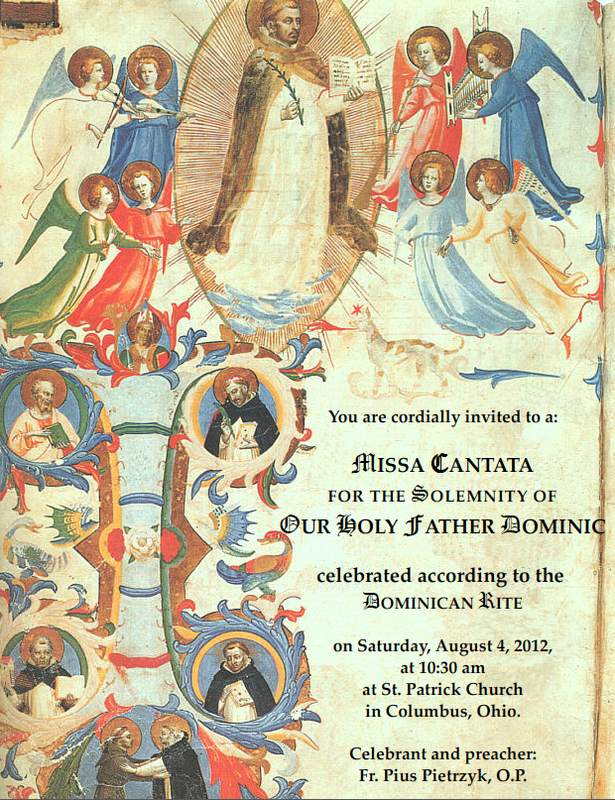 In the wake of a very fruitful celebration this past March of St. Thomas Aquinas’s feast, with a Dominican Rite Mass at St. Vincent Ferrer in New York City, the Dominican Friars at St. Patrick’s in Columbus, OH are happy to announce the celebration of the Solemnity of Holy Father Dominic with a Missa Cantata, celebrated according to the Dominican Rite, on Saturday, August 4th at 10:30 AM. In the old calendar of the Mass, the Solemnity of Our Holy Father Dominic fell on August 4. The Dominican Order has long maintained its own liturgical rite, mostly unchanged since its adoption in the middle ages. 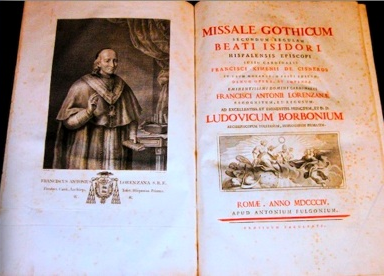 With the Missal of Pope Paul VI, the Order largely set aside its own liturgical rite in favor of the new Roman Rite, although retaining the right to celebrate it. However, with the promulgation of Summorum Pontificum and Universae Ecclesiae, the Holy Father has now given broad permission to all Dominican priests to celebrate the Mass according to the Dominican Rite, as it existed before the Second Vatican Council. 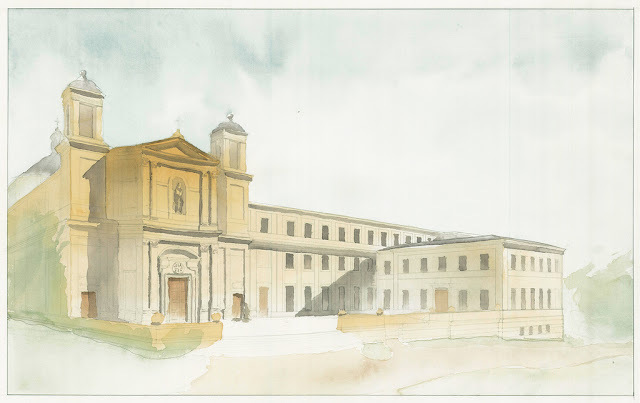 It is, in a sense, the ‘extraordinary form’ for the Dominican Order. 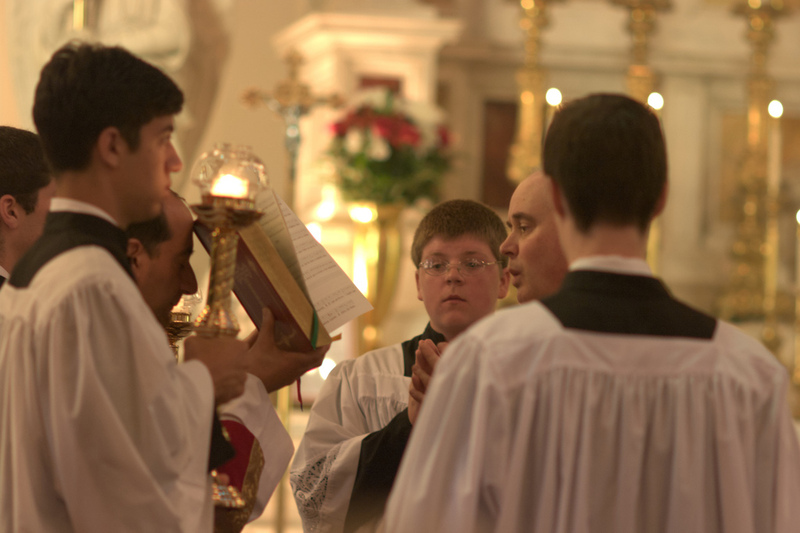 For more information on the Dominican Rite, see the special section in this website. This Mass is open to the public. 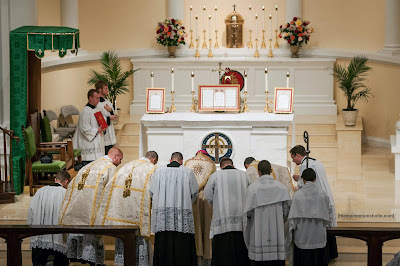 Might I encourage any readers who are within striking distance of Columbus to consider attending, showing your support for the Dominican rite and, beyond that, support for the broader liturgical patrimony of the Latin rite? Of course, it is also a wonderful opportunity to see a liturgical form that one might not get to see as readily as the Roman rite. A reader sends in photos of a pilgrimage to the Shrine of Our Lady of Mount Carmel in East Harlem, New York, on Saturday, July 21.